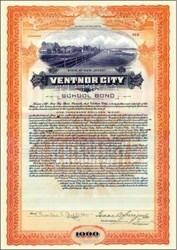 Beautifully engraved $1,000 Bond Certificate from the City of Ventnor, New Jersey issued no later than 1939. This historic document was printed by the Security Banknote Company and has an ornate border around it with a vignette of an old boardwalk. This item is handsigned signed by the city's mayor and is over 64 years old. These were issued for Schools and Water Works. Ventnor City (1990 pop. 11,005), Atlantic county., SE N.J.; inc. 1903. It is a popular seaside resort adjacent to Atlantic City. Located on a 10-mi (16-km) sand bar known as Absecon Beach, Ventnor City is residential and noted for its elaborate homes.